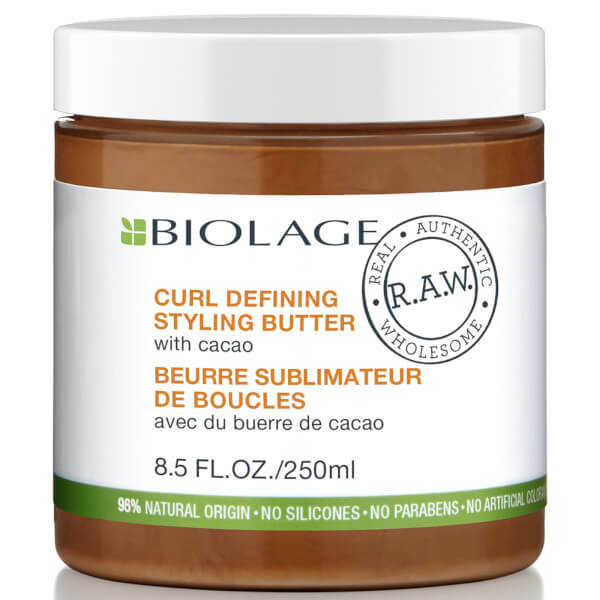 Achieve enviable curls without unwanted crunch using the Biolage R.A.W. Curl Defining Styling Butter; a Cacao infused formula that effortlessly defines curls. Gliding easily through damp locks, the styling butter works to nourish the fibre, while offering flexible hold that ensures curls stay flawless for up to 48 hours. On dry hair, the formula can be used to create further definition; enhancing volume at the roots and loosening curls for a big and bouncy finish. Expect natural looking curls that are smooth, defined and tamed. On damp hair, begin with a small amount and apply more if needed. Let air-dry or use a diffuser. Tousle at roots and throughout to boost volume and loosen up the curl. Aqua / Water, Cetearyl Alcohol, Cera Alba / Beeswax, Isopropyl Myristate, Glycerin, Glyceryl Stearate Se, Caramel, Benzyl Alcohol, Cetyl Esters, Cetearyl Glucoside, Caprylyl Glycol, Hydroxypropyl Guar, Theobroma Cacao Seed Butter / Cocoa Seed Butter.